Without question, for your projects to get completed on time and to your satisfaction, you require a dedicated work area. To get you the best work area possible, Ranger offers a line of large, heavy-gauge steel workbenches that are specifically designed to handle the physical rigors of a busy shop. We currently offer three sizes and styles to suit your needs and space restraints. Each workbench is intended to last as long as you work—and beyond. These are the same benches we use in our own BendPak / Ranger facilities, where they are constantly put to heavy use, so making them high-quality and long-lasting is no light matter to us. Starting at $605 + FREE SHIPPING! The RWB-2D is a large workbench that helps you keep your shop clean and organized. With two high-quality locking drawers and almost 12 sq. 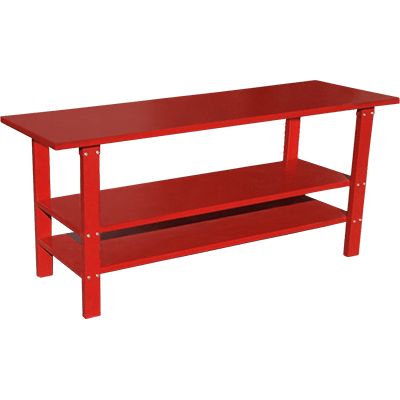 ft. of work area, this bench is perfect for preparing and working on projects of all sizes. Starting at $525 + FREE SHIPPING! The Ranger RWB-1TD is a combination workbench, teardown table and storage center. It's a versatile workstation with all the features that are essential to any well-run garage or workshop. Starting at $570 + FREE SHIPPING! The RWB-2S workbench features a 14 sq. ft. bench top and two long shelves for storage, while the slightly smaller RWB-2D workbench employs a 12 sq. ft. tabletop, two high-quality locking drawers and a single storage shelf. However, if you're looking for maximum versatility and efficiency, look no further than the 500-lb. 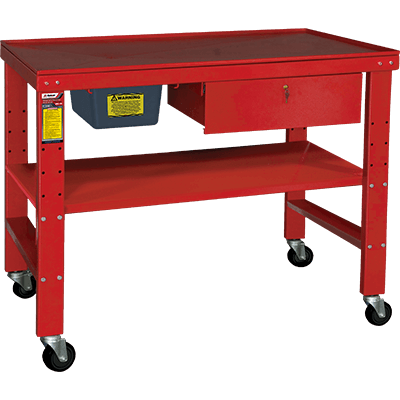 capacity RWB-1TD combination workbench, a complete teardown table and storage facility. The RWB-1TD combination workbench features over 9 sq. ft. of tabletop, a removable fluid container, one lockable drawer and a height-adjustable shelf. All workbench models feature a durable electrostatic oven-baked powder coat, ensuring a chip-free, weather and chemical-resistant surface area that will last for many years of productive ownership. 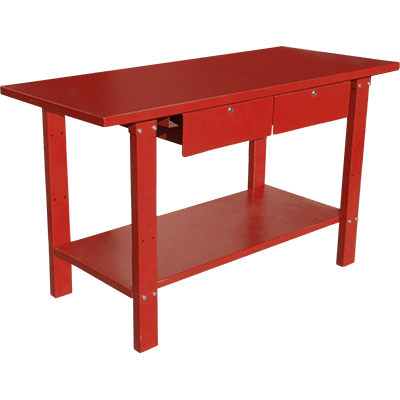 Ranger workbenches are made with the same attention to detail and immaculate quality as our other products, so if you need to bang, twist and wrench with the best of them, no workbench is rugged like Ranger.